Get to know our group! We are a group of physicists and chemists working in a variety of projects related to single molecule and single nano particle topics. Come in to know us better! The group works in a variety of projects from single molecule to single particle physics at room temperature as well as at low temperatures, with a wide range of applications from fundamental physics to biology. Here you can see our past and future group meetings; once a week the entire group gathers to talk about the ongoing research and to discuss about a paper that dragged our attention. Since the early 1990s, one can isolate the optical signal of a single molecule and single-molecule spectroscopy has quickly grown into an important research field. 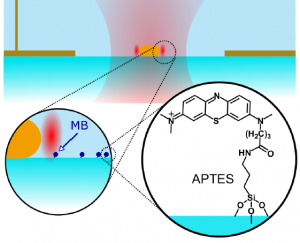 Not only is single-molecule detection the ultimate limit of chemical analysis, it also offers data free from any form of averaging over populations, providing information about molecular electronic structure and photophysics with unprecedented detail. 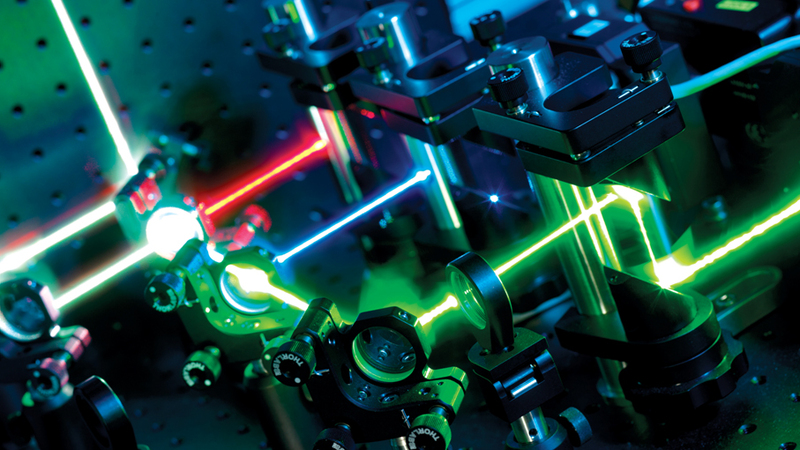 A single molecule can be seen as a well-defined two-level system interacting with laser fields. It is therefore a nice object for nonlinear and quantum optical experiments. A single molecule is also small, often less than a nanometer in size. It can thus serve as a small probe for structure and dynamics of its condensed environment on a local scale of 1 to 100 nanometers. 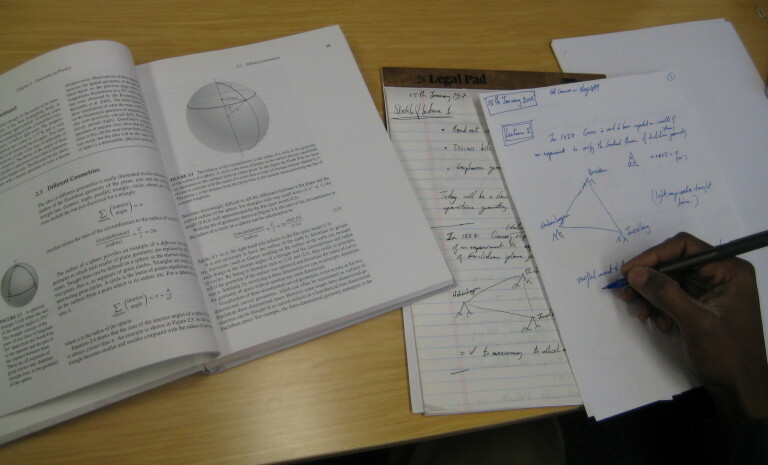 Our aims are to demonstrate and establish optical methods giving access to the nano-world, and to apply them to problems in physical chemistry, materials science, and biomolecular science. Amin’s and Zoran’s work on the linear Stark effect has been published in ChemPhysChem! 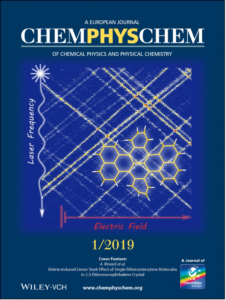 The article, also featured as a cover of the journal, presents the first demonstration of a large linear Stark effect by using a novel strategy of matrix-induced symmetry breaking in otherwise centro-symmetric DBT guest molecules. The article is published in a collaboration with colleagues from the Institute of Physics of Polish Academy of Sciences. More description can be read in the LION press release. Our latest work on two-photon-excited fluorescence of single quantum dots is now published in ACS Photonics! Individual gold nanorods are used to enhance the fluorescence emission of a single quantum dot when it is excited by the absorption of two low energy photons. In a nutshell, we showed more than 10000-fold enhanced fluorescence of a single semiconductor quantum dot using a two-photon-excitation scheme. The high enhancement of this nonlinear effect arises mainly from the local field amplification at the tip of the nanorod. For more details, see the paper. 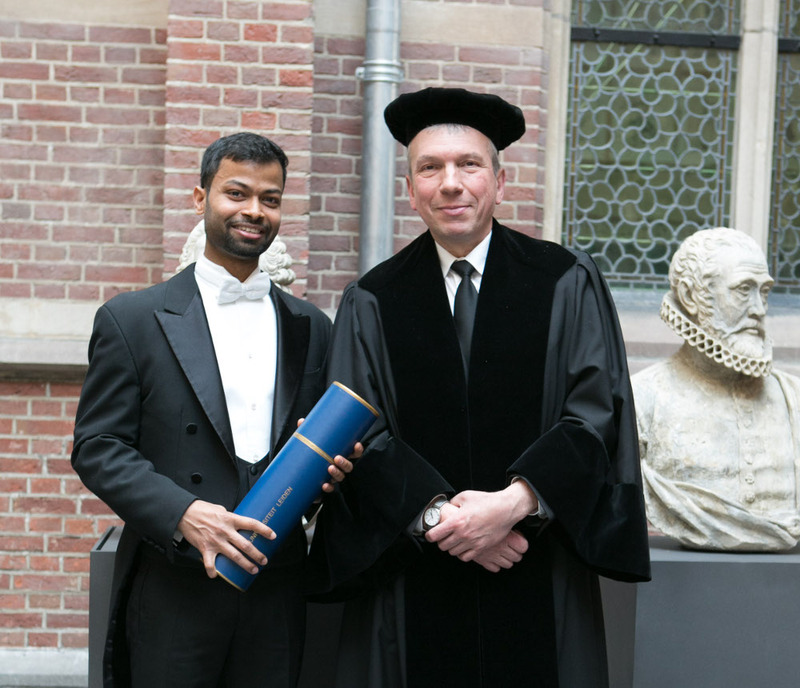 Congratulations to Dr Biswajit Pradhan, who successfully defended his PhD thesis titled “Fluorescence of Single Copper Proteins: Dynamic Disorder and Enhancement by a Gold Nanorod” on Tuesday 3 April 2018 at Leiden University’s Academy Building in the traditional manner. Dr. Biswajit Pradhan with his supervisor, Prof.dr. Michel Orrit. Michel Orrit will present several optical methods giving access to signals from single molecules and single gold nanoparticles. Single gold nanoparticles are interesting because of their strong interaction with light mediated by their plasmon resonance, and because they are chemically and photochemically very stable. The experiments are based on fluorescence or photoluminescence, scattering, absorption detected by photothermal contrast, purely refractive effects leading to shifts of the plasmon resonance, or plasmon-enhanced fluorescence of weak emitters. Some chosen results will demonstrate the power of these experiments to explore the nanoworld in a non-invasive way. On 16 June 2017, the Netherlands Organisation for Scientific Research NWO announced that Professor Michel Orrit is among the winners of this year’s Spinoza prize. 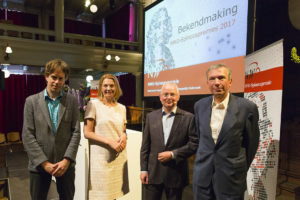 The Spinoza Prize is the highest Dutch scientific award, and comes with a grant of 2.5 million euro to be spent on further scientific research. 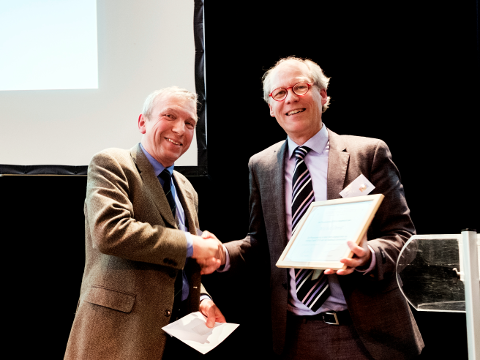 This high honour was awarded to Prof. Orrit in recognition of his seminal work in the field of single-molecule spectroscopy. 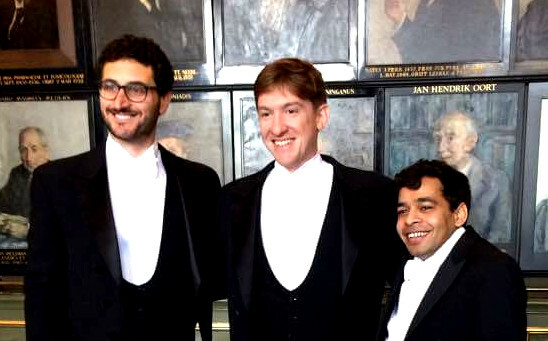 Congratulations to Dr Aquiles Carattino, who successfully defended his PhD thesis titled “Gold Nanorod Photoluminescence — Applications to Imaging and Temperature Sensing” on Thursday 9 March 2017 at Leiden University’s Academy Building in the traditional manner. We are proud of our recent publication on single-molecule electrochemistry using enhanced fluorescence as readout. At both ends of the nanorod (yellow), the incoming electromagnetic field of light is amplified by a factor 300 (red spots). If a molecule (blue dots) is situated there, its fluorescent signal is gets 500 times stronger. We used gold nanorods as nanoatennas to reveal single-molecules of a redox sensitive dye, Methylene Blue, and studied the electrochemical properties of this molecule one by one. Within the past year, Michel Orrit has also been awarded the Physica Prize by the Dutch Stichting Physica and the Nederlandse Natuurkundige Vereniging as well as the Grand Prix Léon Brillouin by the Société Française d’Optique. 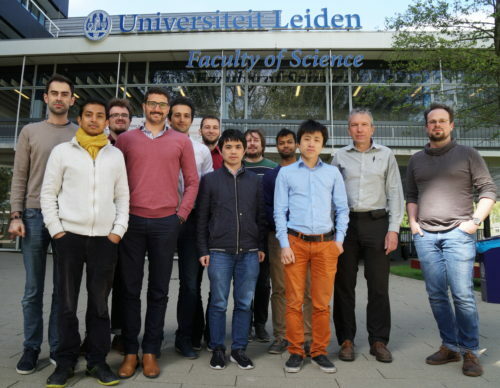 Read the announcement on the website of the Leiden Institute of Physics. The Nederlandse Natuurkundige Vereniging and Stichting Physica have announced that Michel Orrit will receive the national Physica Prize 2016. Michel Orrit is honoured with the prize for his groundbreaking work on single molecule spectroscopy. In the mid ‘80s, Orrit came to the realization that it should be possible to optically detect a single molecule. A few years later, in 1990, he indeed became the first one to detect the fluorescence signal of one molecule. 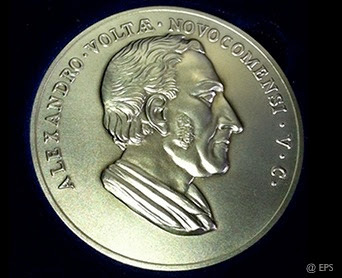 Last year, the Nobel Prize in Chemistry was awarded to Betzig, Hell and Moerner for the development of super-resolved fluorescence microscopy. The Nobel Committee’s description of the scientific background clearly showed the groundbreaking significance of Orrit’s experiment as the basis for the super-resolution techniques that were established afterwards. Moerner measured a single molecule slightly before Orrit, using absorption, but Orrit’s measurement using fluorescence produced much less background noise and became the standard in this scientific field.